The only issue we have (so far) of a Carver High School newspaper. Mount Olive, NC, May 1950. From our estimation, DigitalNC shares more digitized historical North Carolina African American newspapers than any other source. Contributors range from our state’s HBCUs to local libraries and museums. To help pull these titles together, we created an exhibit page through which you can search and browse eleven community papers and nine student papers. There are also links to more available on other sites. Below we’ve re-posted the essay from the exhibit, giving you a brief history of these papers. We hope that we’ll hear from others who may be interested in sharing more of these rare resources online. Since the publication of Freedom’s Journal in 1827 in New York City, African American newspapers have had a long and impactful history in the United States. Begun as a platform to decry the treatment of slaves, the earliest African American newspapers appealed to whites, who were politically enfranchised. After the Civil War, as newly freed African Americans claimed the right to literacy, the number of African American newspapers around the country grew exponentially and the editors began addressing blacks instead of whites. Papers turned their focus from slavery to a variety of subjects: religion, politics, art, literature, and news as viewed through the eyes of African American reporters and readers. Communication about black political and social struggles through Reconstruction and, later, the Civil Rights movement, cemented newspapers as integral to African American life. In North Carolina, the first African American papers were religious publications. The North Carolina Christian Advocate, which appears to be the earliest, was published from 1855-1861 by the North Carolina Conference of the Methodist Episcopal Church, followed by the Episcopal Methodist, a shorter-lived publication produced during the Civil War by the same organization. After the Civil War, the number of African American newspapers continued to grow in North Carolina, reaching a peak during the 1880s and 1890s with more than 30 known titles beginning during that time. The longest running African American paper established in North Carolina is the Star of Zion, originating in Charlotte in 1876 and still being produced today. Other long-running papers in the state include the Charlotte Post (begun 1890), The Carolina Times (Durham, begun 1919), the Carolinian (Raleigh, begun 1940), Carolina Peacemaker (Greensboro, begun 1967), and the Winston-Salem Chronicle (begun 1974). Many of these long running papers powerfully documented black culture and opinion in North Carolina during the 1960s-1970s, with numerous editorials and original reporting of local and national civil rights news. 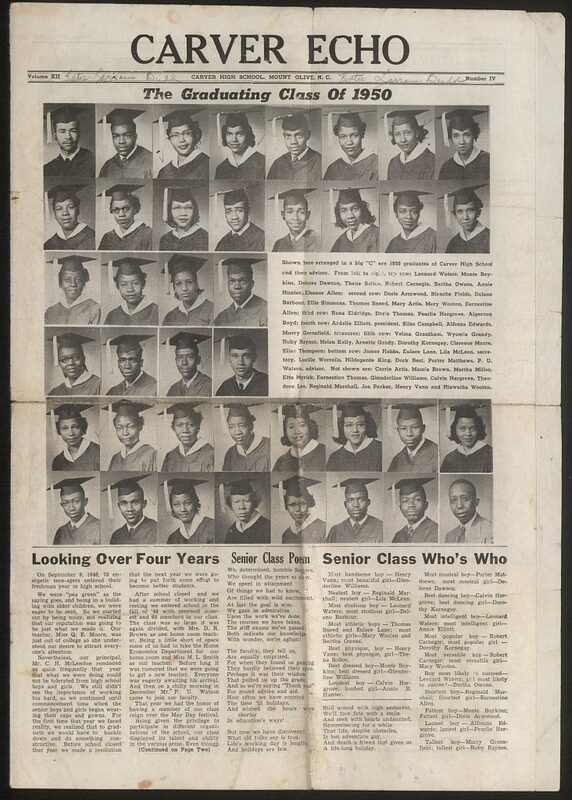 Occasionally overlooked sources for African American newspapers are North Carolina’s Historically Black Colleges and Universities (HBCU) and, before integration, African American high schools. You’ll find links on DigitalNC to newspapers from eight of North Carolina’s twelve current and historical HBCUs as well as two African American high schools. While many African American newspapers have found their way into archives and libraries, it’s common to see broken runs and missing issues. You can find a great inventory of known papers from the UNC Libraries. If you work for a library, archive, or museum in North Carolina holding additional issues and would like to inquire about digitizing them and making them available online, please let us know.